I first read Eva Underground back in January of 2007. It had been out about a year at that point and so it's certainly not an older book, but it is very underrepresented in my opinion. I can no longer remember exactly where I heard about it and I'm pretty sure I picked it up based on the strength of the cover alone. Take a look at that baby. Just gorgeous. And an actual scene from the book--one of my very favorite things. The fact that it was YA historical fiction set during the late 1970s in Communist-occupied Poland certainly intrigued me. You don't get many of those, you know? I had never heard of Dandi Daley Mackall before, but my library happily had a copy on the shelves so I went and checked it out immediately. And I'm still surprised at how little I see this book mentioned around the blogosphere because it's really rather lovely and a thoughtful, well-researched coming-of-age tale as opposed to an flimsy excuse to hook the main character up with a Polish hottie and gallivant across the countryside amorously. Not that I wouldn't read that book! Don't get me wrong. But, in the end, I infinitely prefer a realistic and resonant tale such as this one. The year is 1978. Eva Lott is feeling pretty good about life in general. Her senior year is shaping up to be pretty close to perfect and she's just made the varsity swim team. Then her English professor father has to go and ruin it all by announcing that the two of them are moving. To Poland. Effective immediately. It turns out he's decided to join the underground movement and Eva has no choice but to tag along. She spends the first portion of the story coming up with increasingly far-fetched ways she can sneak back to the States or convince her father she has no business being in Poland at all. Meanwhile, her father settles in to teach his young compatriots about journalism as they work to smuggle an illegal printing press into their home in order to spread their message opposing the rampant oppression of freedom of speech and the Polish people. When Eva finds herself rubbing shoulders with political activists no older than herself, things take on a slightly different slant. And when she gets to know Tomek--one of the rebels living in the crowded house her father takes her to, Eva's perspective begins to change on so many levels it is difficult for her to take it all in and her life in Chicago seems a very far away, very tame place indeed. Until I read this book, I knew next to nothing about the modern-day Communist occupation of Poland. Following Eva as she leaves her home and friends in Chicago to follow her father to Poland, sharing a tiny room with him in a house full of rebels, I found myself quickly caught up. Though she initially sounds and acts like the stereotypical clueless, privileged spoiled teenager, she becomes curious and sensitive to the culture and history of her new home once the importance of what is going on around her begins to sink in. Everything about this novel unfolds slowly. So slowly that you don't at first realize how involved you've become. But it's certainly a journey worth taking. Their initial border crossing is vividly tense and chilling. You feel, along with the entire group of rebels, the suffocation and knife edge intensity of the occupation. Eva learns that sometimes life takes you by the throat and hurls you bodily into the middle of a war zone. She learns there are things in that war zone worth fighting for, that her life can be bigger than it was, that the seed of a plum can hold the spirit of a nation. And the ending is worth every page that it takes to get there. I finished it both satisfied and moved. Eva Underground is a wonderful read about a harrowing and fascinating period in history. This looks interesting, Angie. The cover is gorgeous, too. 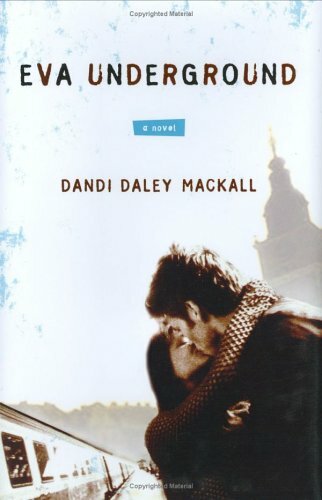 European background, couple kissing, (not to mention a scene from the book) what's not to like? Did you get this from Orem? Le sigh. You write some lovely reviews Angie. I liked this one. Holly, I know! And, no, I got it from Provo and then went and bought my own copy. I hadn't heard of this. It sounds excellent! Great review as always, Angie! This looks very interesting and I'm going to add it to my TBR. I love the cover too. Chachic, I just loved it on sight. A happy cover. And a most excellent moment in the book. Oh this sounds good I like the vibe, plus I could learn something lol. This sounds great! Can't wait to read it once summer rolls around and I finally have time to read again. Emily, I know how you feel. This one will make perfect summer reading material. Sarah, I am so happy that you ordered it and loved the first 50 pages. Aren't they something? I had to order a copy, too, right after finishing the one I borrowed from the library. I just needed the book in my home. I'm sorry you have to wait! Let me know your thoughts when you finish it! I should mention that I got an email from a reader who read this review and immediately bought the book as she herself was a Polish immigrant and the events of the book were exactly what her parents were experiencing at that time. I was amazed and thrilled to hear that and thought you might be as well. Thank you so much for stopping in!